Oracle Exadata Database Machine has been critical for the digital transformation of many companies. But in many cases Oracle Exadata customers have to use multiple tools for monitoring, troubleshooting, and capacity planning of their estates. Oracle Management Cloud (OMC), a 100 percent cloud-based solution for monitoring, management, and analytics, is here to maximize the Value of Your Oracle Exadata Investment. Oracle Management Cloud is a suite of automated management services that eliminates the human effort associated with traditional solutions for monitoring, managing, and securing applications. With Oracle Management Cloud, and its’ embedded automated management capabilities, customers can consolidate more databases on their Oracle Exadata systems, get better database performance when running large numbers of databases and achieve higher utilization of resources. Oracle Management Cloud, complements Enterprise Manager, and delivers a complete solution for monitoring Oracle Exadata environments with rapid time-to-value. Leveraging rich, purpose-built machine learning, it delivers actionable insights across on-premise and cloud environments, for any organization. 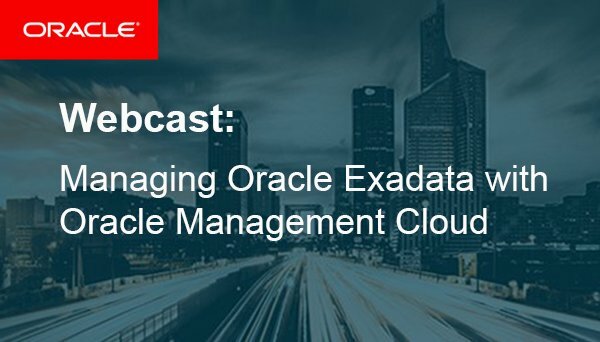 Join us on this partner webcast as we introduce Oracle Management Cloud, Oracles’ next-generation management suite, and we focus on the unique capabilities and insights automating Oracle Exadata management.